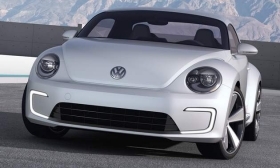 The E-Bugster suggests future possibilities for VW's iconic Beetle. Combining electric power and a curvy two-seat configuration, the E-Bugster concept for the Detroit auto show offers a sporty, futuristic take on the Volkswagen Beetle. The name blends "E" (for electric), "Bug" (for obvious reasons) and "speedster" to form the rather unusual moniker. The car is based on the latest edition of the Beetle, which launched in 2011. While it's just a concept, the E-Bugster suggests future possibilities for VW's iconic car. The electric powertrain is called "Blue e-motion," and it uses a 114-hp electric motor that runs on a lithium-ion battery stored under the floor. The battery weighs 695 pounds (316 kg), and range is expected to be more than 100 miles (170 km). It can be powered to 80 percent capability using a quick-charge method. The plug is located beneath the VW logo on the hood. 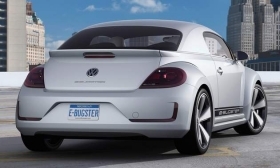 Stylistically, the E-Bugster is a new take on Beetle design. It uses the LED running lights from the production model, though in an altered setup, forming a graphic on each side of the lower air intake. This cue also shows up on the back bumper as one of VW's electric-vehicle traits. The flat roof is meant to convey the look of a chopped speedster, and the car rolls on 20-inch wheels. Inside are gauges tailored to the E-Bugster's electric prowess, and the tachometer is swapped for an energy-consumption display. There also are indicators for the battery range and charge.